In order to put into perspective my walk towards the diaconate calling, it’s important to let you know a bit of the background leading to this decision…. I want to share my walk during the 5 years the diaconate program takes with you and promise future postings will be shorter! In my late teens I experienced what I thought to be a strong calling to the priesthood. While growing up I had been blessed with great examples of Catholic priests. At church, at school and even at home, I interacted with men that gave their life to Christ. I was guided in my discernment to the priesthood by a wonderful priest with a deep spirituality. I announced my decision to the world, including my parents. After a few months of discernment I realized the priestly life wasn’t for me. I remember like it was yesterday telling my father I had changed my mind. He took it stoically but am sure at some level it must have been a disappointment. I found out later in life my father and uncle had anointed my future as a priest when I was first-born! I was fortunate to find a life partner that had a similarly strong yearning to walk in the Lord’s path. Yes we struggled and had our valley’s and very dry desserts, but our faith always gave us the fuel to keep on trying to figure out how to grow old together with the Lord. After our first daughter was born, Cami, I felt another tug towards a deeper calling. I applied for the diaconate to become an ordained Catholic deacon. The powers to be at the time were much wiser than I and realized I was too young, 35 years old, and my daughter was too young for the demands of this calling. Throughout the years I was blessed because of my involvement in the Emmaus men’s ministry, the marriage teams in our parish, the Knight of Columbus and the Retrovaille marriage experience. Retrovaille gave us the tools necessary to avoid a difficult patch in our marriage that could have led to divorce. We now have another beautiful daughter named Isa. The girls are now 15 and 25 respectively. A few years ago I again felt the calling to a more devoted life in my faith. With a lot of enthusiasm and sure that the third time is the charm, I called the archdiocese office to apply for the diaconate program once again. It turned out to be an anti-climatic effort. The archdiocese was in the middle of a top down review of the entire diaconate program! As I mentioned earlier, I am blessed to be involved with a great group of ministries. I threw myself into serving the best way I knew how. This past May, speaking to one of the deacons at our parish, he mentioned the program was back on and that the director of the program had asked the deacon to contact me because he had misplaced my information! This time I really felt it was going to happen. I prayed al lot and asked my wife to be part of the decision-making process during my discernment. The archdiocese, to their credit, makes sure the spouse is a big part of the decision-making process. In fact, one cannot even begin the program without her written approval. Her approval is required after the first year of the aspirancy program, then again throughout the 5 years. Before the ordination, my wife has to sit down with the archbishop and give another written permission for me to go ahead with the final step. The discernment process brought a lot of second guessing because the program is so time intensive that I would have to stop participating in all the ministries I am involved in. My wife and I are in the best place we have ever been in our marriage and that is because of our working together in the marriage parish teams and in Retrovaille. I would now have to give those up somewhat, as well as giving up my service to my beloved Emmaus and Knights. You see the diaconate program is 5 years long. The first year is called aspirancy. During that year, all involved, my wife, my pastor, the archbishop and myself have time to evaluate fi this is really for me. Then you start 4 years of continued education and training leading to your ordination. The 5 years involves: one weekend a month at the major seminary in Boynton Beach, every Wednesday evening and 3 Saturdays a month at the minor seminary at St. John’s Vianney in Miami. Intense research and projects are involved during the time one is not in class. As you can see, this leaves little tine for family, let alone other ministries. My wife and I spent an entire day at the beach with a deacon and his wife talking about the challenges of the program. Nothing was whitewashed. It is a very intense commitment and it will take me away from family life. But the blessings bestowed are far superior to any of the negatives that may be involved! After we left the beach that day we were convinced we would embrace this calling together and enthusiastically! The application process involved a recommendation letter from my pastor. I was told that was the determining factor as to whether you were accepted or not into the program. I was very blessed to have received a strong and heartfelt letter from my pastor to the archbishop. I had the entire packet into the archdiocese by June 1st for a July 1st deadline. And then the waiting began! By July 20th I hadn’t heard a word and the Devil was having a field day with my psyche. I began to fill my mind with second guessing and self-doubt. I couldn’t believe how much the uncertainty of not knowing if I was selected controlled my brain. Thoughts about not hearing anything from the archdiocese filled me 24/7! I started thinking who was I kidding wanting to become a deacon, maybe there are better candidates and I was especially bothered that I told so many people! What if they said no, I wasn’t prepared? What a man of great faith! As God usually does with my life, the moment I put the entire process in His hands and trusted….I was called by the deacon in charge of the program to tell me I was an excellent candidate and that the archbishop would have the final say on August 1…! So…. I will continue to pray and be thankful that the Lord may want me to serve in a deeper capacity as a deacon and if He doesn’t it is because there is so much more work for me to do in my current ministries….Stay tuned! 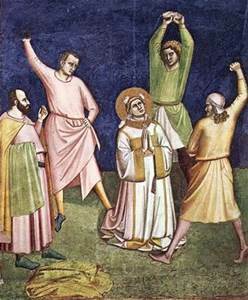 The first martyr of the Catholic Church is believed to be Saint Stephen; the first ordained Deacon of the Church! This entry was posted on Sunday, July 27th, 2014 at 8:36 pm and is filed under calling, catholic, Catholic Family Life, Deacon, discernment, prayer. You can follow any responses to this entry through the RSS 2.0 feed. You can leave a response, or trackback from your own site.